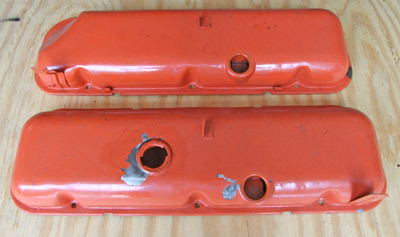 The steel valve covers on my '67 big block Corvette coupe had seen better days, what with paint peeling and traces of rust starting to lift the paint in other spots. This is a natural occurrence when you live in a reasonably damp and humid environment, such as on the New Jersey shore where I hang my hat. I decided that some under-hood beautification was long overdue so I took off my valve covers and proceeded to refurbish them, documenting the process along the way. To get the absolute best results, you'll have to strip the valve covers down to bare metal. While you can use chemical paint strippers, I don't like them at all for a three reasons: 1) the stuff is very caustic; 2) disposing of it is not easy if you want to be ecologically correct; and 3) the stuff makes a royal mess. That being said, the other logical choice is sand- or bead-blasting, and that's the route I chose to go. You don't need a large or expensive blasting cabinet to do this job. I use a hand-held sand-blasting gun I got from Sears for about $50, and it does a very adequate job on items like valve covers, intake manifolds and other small parts. The gun holds about 5 lb. 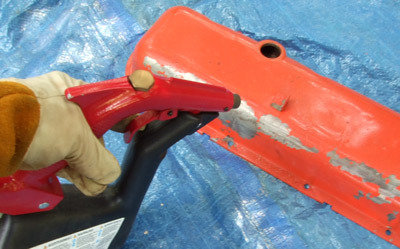 of blasting media which does quite a bit of surface area. Of course, you'll need an air compressor to power the blasting gun. And you'll definitely want to use eye protection, some heavy gloves and other protective clothing — sand particles propelled at high speed HURT! I highly recommend using a face shield rather than just goggles, since getting pelted in the face with ricocheting sand is no fun, believe me! 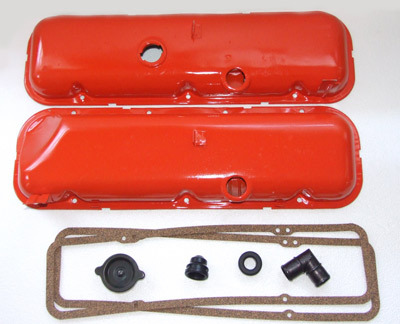 You're also going to need some primer to seal and prep the bare steel for paint, and you'll also need the appropriate color spray enamel for your valve covers. My '67 required good old Chevy Orange, but for later years blue will be the right color. 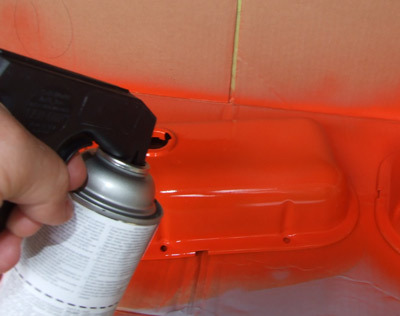 While you're at it, you would do well to get yourself a couple of spray can trigger grips — they make controlling the spray a lot easier and much more comfortable than pressing the spray button on the can with your finger. Be sure to choose a work area that has lots of light and is far enough away from other objects you don't want to get hit with sand or overspray. I used a plastic tarp in the yard to blast on, and this (or an old shower curtain) will work just as well in your driveway. In addition to catching the spent sand, there will also be paint particles and chips in the mix, and this paint waste is toxic, so dispose of this sandy refuse in a responsible manner. As I mentioned, I live on the NJ shore, so getting sand is no problem whatsoever — it's literally all over the place. However, if you live in an area that's far away from the beach you can pick up a 50-lb. bag of play box sand or sand for cement mixing at the local home center for under $5.00; 50-lbs. will be more than enough to do a pair of valve covers and you'll have plenty of it left over for other projects, too. As for spraying the primer and color coats, the ideal situation is to have a spray booth, so if you have access to one, by all means use it. I, however, don't have that luxury so my spray station consisted of a piece of plywood on two saw horses in my garage with the door open for ventilation. I used a disassembled cardboard box to act as a backsplash and I wore a disposable dust mask; a respirator offers better lung and bronchial protection, however. Make sure you have plenty of ventilation. Before we get on with the step-by-step photos, a few words about painting are in order. The first and most important rule when using aerosol spray paints is to shake, shake, and shake! The better you mix the paint, the better it will cover. The second thing is to put on several light coats, rather than a heavy, wet coat. A heavy coat takes longer to dry, increases the chances for a run and won't give you a uniform finish. OK, so let's get started. Here are my valve covers as they looked when taken off my engine. You can see where they paint has chipped off and it's starting to lift in other spots due to dampness. 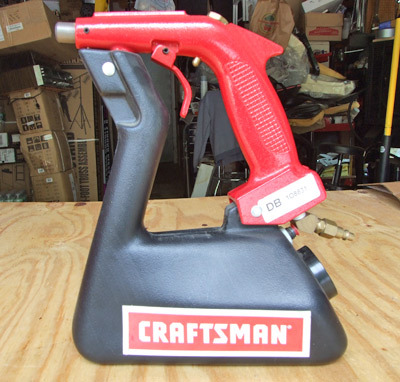 This Craftsman hand-held sandblasting gun from Sears is compact, affordable and very efficient. The large knob below the air connector is the filler cap. The gun holds about 5 lbs. of sand at a time; more than that would make it too heavy and unmanageable. 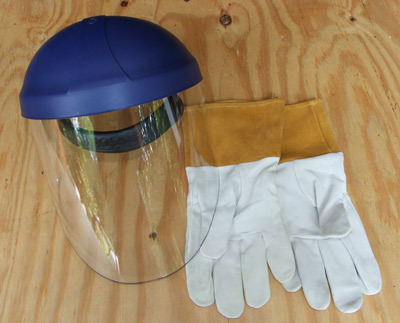 A face shield and heavy work gloves like these Tillman's are great for protecting you from flying sand. I also wore a long-sleeve sweatshirt, heavy jeans, thick athletic socks and work shoes to eliminate the sting of fast-flying sand particles. 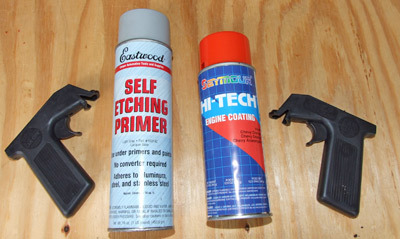 I like Eastwood's self-etching primer for all my metal prep work. Aerosol Chevy Orange (or blue if that's what you need) is available from any decent auto parts store. The blasted sand really takes the paint off in a hurry. I used beach sand because it's plentiful and free in my neck of the woods, but sandbox sand or cement-mixing sand works just as well. Here's one of the valve covers completely blasted. I highly recommend getting a coat of primer on the bare metal as soon as possible to minimize the chances for any oxidation. Remember: rust never sleeps! 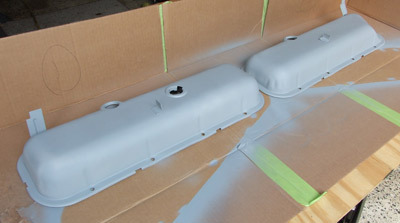 Here's what the pair of blasted covers looked like with several coats of primer on them. As with the finish color, apply the primer in several light coats rather than a single, heavy wet coat for best results. I'm applying another light coat of Chevy Orange here. I used a disposable dust mask to keep the paint overspray from entering my breathing passages and had the garage door completely open for ventilation. 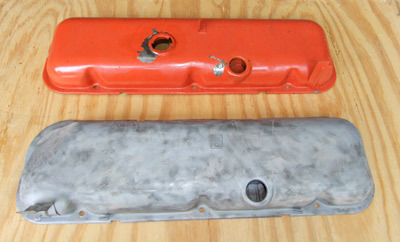 Here are the finished valve covers ready to be re-installed in my big block coupe. A nice new oil filler cap, breather elbow, rubber grommets and cork valve covers from Paragon Reproductions will add the finishing touches and make the installation look as good as it did when the '67 left the factory forty-one years ago!